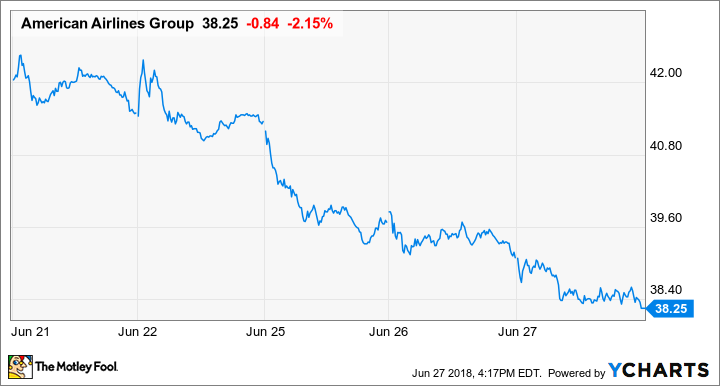 American Airlines stock has lost more than a quarter of its value over the past three months, but there are still better opportunities for investors in the airline sector. Airline stocks have plunged this week for two major reasons. First, trade tensions with China caused investors to start worrying about demand. Second, oil prices have started moving higher again, following a brief respite prior to last week's OPEC meeting. American Airlines Weekly Stock Chart, data by YCharts. American Airlines stock closed at $38.26 on Wednesday, its lowest level since 2016. Yet while the stock is starting to look cheap, investors would probably be better off sticking with shares of its smaller rival, JetBlue Airways (NASDAQ:JBLU). In 2017, American Airlines' pre-tax margin fell to 9.1% from 12.6% a year earlier (and more than 15% a year before that). Profitability is set to decline again in 2018. While American Airlines has posted solid unit revenue growth over the past two years and is even starting to get nonfuel unit costs under control, it hasn't been able to fully cover the recent increases in its fuel costs. American's management does recognize that it must stabilize the company's profitability, even if fuel prices continue to trend higher. In early May, American Airlines decided to cancel its Chicago-Beijing route, which has been losing tens of millions of dollars every year. American Airlines is also reducing or eliminating service on several routes to Brazil. The capacity from these routes is being redeployed in markets that are likely to perform better based on current demand conditions, including Argentina, Hawaii, the Caribbean, and Europe. American Airlines is ready to make additional route adjustments if needed, such as dropping its other loss-making routes from Chicago to Asia. These moves may help American Airlines slow or even reverse its profit declines. American Airlines may face stiff competition on domestic routes in the coming years. Image source: American Airlines. In the long run, JetBlue Airways' steady growth represents an even bigger threat. Unlike other competitors that American Airlines has faced in the past, JetBlue threatens to steal some of American's most valuable customers by underpricing it on premium seats -- and potentially offering better service. JetBlue's combination of price and service allowed it to become a force in the New York-Los Angeles and New York-San Francisco markets between 2014 and 2015. It's upgraded 10 more transcontinental routes to its Mint premium service since then, with great success. Flights to Europe could be the carrier's next target. JetBlue is currently evaluating adding a long-range version of the Airbus A321 to its fleet, which would enable flights from the Northeast to much of Western Europe. A natural first step would be flying from its New York and Boston focus cities to London. American Airlines and joint venture partner British Airways currently fly four times a day from Boston to London and 16 times a day from New York to London. These routes are particularly lucrative for the two carriers. With the A321LR, JetBlue could also fly from its Fort Lauderdale focus city further into South America, disrupting American's monopoly on several routes to South America from Miami. Thus, American Airlines could be uniquely vulnerable to JetBlue's future growth. After its recent tumble, American Airlines stock trades for less than eight times analysts' 2018 earnings expectations. If oil prices recede and American is able to continue posting even modest unit revenue growth, EPS could surge higher over the next few years, making American Airlines stock a steal at its current price. That said, oil prices could continue to rise. Furthermore, increasing competition -- especially for premium passengers -- could erode American's unit revenue growth. To make matters worse, American Airlines has a huge debt load, making it vulnerable to an industry downturn. By contrast, JetBlue has a pristine balance sheet, with almost as much cash as debt on the books. JetBlue's focus on coastal markets and transcontinental flights makes it less vulnerable to the fare wars occurring in Mid-Continent hub markets. JetBlue also has a lot more room to grow than American Airlines, thanks to its comparatively small size today. Despite all of these advantages, JetBlue stock trades for just 11 times analysts' 2018 earnings estimates. Long-term investors are likely to be better off paying a modest premium and betting on this disruptive growth company rather than trying to time a bottom in American Airlines stock.